What book about nutrition do you frequently recommend to friends? My Year of Meats, by Ruth Ozeki. Long ago, a copy was given to me by the great Jerry Shively. It’s not actually about nutrition but it’s fun and insightful about food. If people really want to learn about nutrition science, check out a standard textbook like Wardlaw’s Contemporary Nutrition. It’s surprisingly readable. How much does diet really affect mood and psychological well-being? A lot. In my experience, mood and metabolism are closely related, but I’m no psychologist — at Tufts our expert on this is Robin Kanarek. No. I see no reason why everyone “should” be vegan. But many people often eat too much red and processed meat, relative to what most nutritionists consider a healthy diet. The most recent instance of this argument is the EAT-Lancet report led by Walter Willett, who is the world champion of this view. Another reason to limit animal foods is that livestock are often treated terribly, and also cause environmental harm (eg the methane burps of cows and other ruminants, and the land used to grow feed which would otherwise be used in other ways), as well as antibiotic resistance (in settings where antibiotics for livestock are overused). But none of those harms provide a persuasive call for zero animal foods, or even near-zero. Ultimately it’s pretty clear that the evidence favors a reducitarian or flexitarian approach, in which choices depends on local circumstances at each place and time. In my view, zero is the right number mainly for people who want bright lines and absolute rules. Often that rigidity is a temporary — a first step towards a balanced approach. A diet with some red meat, poultry or pork, milk and eggs can easily be helpful. These food groups are needed for human health especially in utero and infancy for maternal and child health, and useful in agriculture for crop-livestock interactions. Even animal welfare does not call for zero farmed animals, since that argument would rely on an ethical argument that places any suffering above the value of coming to life in the first place. On this and other topics, the biggest challenge I see is how to improve our own diets while helping others get more of what they want and need. It’s not helpful to focus only on improving the diets of relatively privileged people, without doing what we can to bring better diets into reach for everyone else. As far as I can tell, the main danger associated with veganism is sanctimony — real or perceived. Whenever one groups casts itself as enlightened, others will push back and proponents risk getting stuck in an echo chamber. Some people are very skilled at pursuing their own ideals without losing contact with others, like the brilliant journalist Ezra Klein in his memorable interview with Melanie Joy. I don’t know about meal size as such, but intermittent fasting seems like one of the most exciting new frontiers in nutrition. Allowing for more complete digestion of everything one has eaten, especially overnight, could be a good idea for many reasons. I’m not sure the term “fasting” is the right word, however — I’d rather just call it concentrated mealtimes, choosing times when one can plan ahead for mindful eating. A bathroom scale, around $20. It’s an amazing technology, but challenging to ignore fluctuations and use it only to see trends. If I were an entrepreneur I’d make one whose screen shows each day only as a dot relative to your moving average, and glows to say thanks when you step on it every day at about the same time. Like a wifi scale, but simpler and cheaper. What are the two foods you’d recommend to stop eating or drastically cut out? I wouldn’t. First because I’m not a dietitian, but also because I know they don’t shout against any one or two foods. They focus on the whole diet, because when we deliberately cut out something, we often compensate in other ways. Ingredients are another matter — one priority for global health is to spread the ban on trans fats to developing countries like India. What is worst advice you hear people give in the nutrition community routinely? I’ll pass — there’s too much noise, and no need to single out anything in particular. There’s nothing I would recommend to everyone. I happen to love peanut butter, but maybe that’s because it was a favorite after-school snack when I was little, and also a popular luxury among villagers in rural Zimbabwe where I lived after college. In general, I like buying things like peanuts that are often grown by poorer farmers, since those crops usually employ a lot of workers and don’t require too much energy or water. Definely pass — weight loss advice is for dietitians and other health professionals, not economists. Again I’m no expert on anything biochemical, but I have seen some evidence suggesting that autophagy, triggered by periods of not eating, can be helpful. What I don’t understand is why call that detoxification — why not just call it healthy metabolism? Presumably that depends on the rest of one’s daily schedule and family circumstances. I’m lucky and can choose my mealtimes, but many people don’t have that luxury. In the past few years, what new attitude or belief has most shaped your understanding of healthy nutrition and lifestyle? So many changes: towards lower carbs and more whole grains, towards healthier fats, concentrated meal times, exercise to avoid back pain, etc., but maybe those changes just trace my own aging! I eat some and then stop. One of the most useful ideas in all of economics is diminishing returns: the first few spoonfuls are the best-tasting, and eventually one reaches the point where harms outweigh benefits. Economics is all about such U-shaped functions, about learning when to slow and stop. Studying the economics of food markets also helps me resist food marketing. A lot of what we find delicious is the power of suggestion. A little bit about you – how would you describe your work on food? We have these dinners just after the class discusses food choice and least-cost diets, meaning the combination of foods that would meet all nutrient needs at the lowest possible expense. For our weekly exercise, students attempt that calculation given current prices in Boston, and compare the result to what very poor people eat in Ethiopia. You can try the exercise yourself using this spreadsheet preloaded with real data, leading to surprising insight about the link between food choice and nutrient needs. Actual food choices are not least-cost diets: people choose foods for other reasons, and often do not actually meet all nutrient needs. In class we look at global diets using the wonderful Peter Menzel and Faith D’Aluisio “hungry planet” photos, from which one big surprise is how food choices in poorer places get closer to the least-cost source of essential nutrients, as in the corn, beans, oil and fruit diet eaten by refugees in Chad. Most of us eat more of some nutrients than we need, which is good because — as our spreadsheet exercise reveals — we cannot do the math in our heads. One insight from our least-cost diet exercise is that, even using a spreadsheet preloaded with items from a well-stocked grocery store and precise measures of food composition, hitting nutrient recommendations exactly requires the use of math programming algorithms that were developed during and after WWII by Stigler and Dantzig. Those formulas are still today being used to improve livestock feed, and to inform nutrition assistance for poor people by the USDA, USAID, WFP and others. Most of the time we have to guess at what’s in our food, and choose items that meet our various goals as best we can. 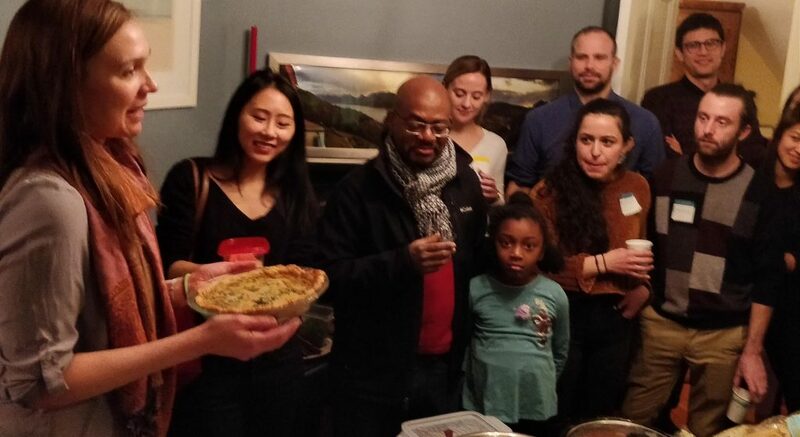 The potluck is a chance to celebrate the diverse objectives we actually pursue when choosing what to eat. To make the potluck fun as well as tasty and nutritious, we invite students to bring dishes that contribute to an overall healthy diet while also pursuing any one of four common aims: (1) convenience, (2) cultural significance, (3) least environmental harm as well as (4) least financial cost. Each student explained their dish, and my esteemed colleagues Nicole Blackstone, Sean Cash, Parke Wilde and Norbert Wilson declared the winners in each category. Stigler’s original estimate of a least-cost diet in 1939 contained only enriched wheat flour, evaporated milk, cabbage, spinach and navy beans. Using Excel to compute the exact least-cost diet in Boston now yields a roughly similar list, including a starring role for depression-era canned spinach, and our latest research from the CANDASA project finds the same kind of items in least cost diets around the world. 2. Mix flour and salt in a large bowl. Cut in shortening with a pastry blender until mixture is completely blended and appears crumbly. 3. Mix in water, 1 tablespoon at a time, by lightly tossing with a fork. Add only enough water to form mixture into a ball. The dough will be sticky and tough if to much water is added, and it will crack and tear when rolled if too little is added. 4. Roll out dough into circle 1 inch larger than the inverted pie plate. 5. Fold circle of dough in half, and gently lift. Place into pie plate and unfold. Either prick the entire surface of dough with a fork, or weight the bottom of the crust with pie weights while baking. Pie weights can be uncooked rice, dried beans, small clean pebbles, or small balls sold as pie weights. 6. Bake for 10 min at 400 F, and then remove weights and continue to bake for another 6-8 minutes until the crust starts to get some color. Remove from oven. 1. Saute onion and garlic in cooking oil on medium heat. Once translucent, add shredded cabbage. Cook down cabbage until wilted and add in spinach, rosemary, thyme, and salt and pepper to taste. Cook until spinach is also wilted– about 4-5 minutes. 2. In a blender, combine drained/rinsed navy beans, evaporated milk, butter, flour, eggs and salt and pepper to taste. Blend on medium-to-high until smooth. 3. Add sauteed vegetables to the the blender ingredients. Blend on low for 20-30 seconds, or until well combined. You can also do this part outside of the blender. 5. Bake in the oven at 350 F for about 60 minutes or until the filling has firmed and started to brown slightly on top. 6. Let rest for at least 15 minutes before serving. 7. Enjoy your Stigler pie masterpiece! The long story starts with the opening phrase of the first modern textbook on principles of economics. That line, from Alfred Marshall in 1890, defines economics as the study of people’s “actions in the ordinary business of life”. More than a century later, we’re still drawing some of the same diagrams from that book, applying a few basic principles to explain, predict and evaluate people’s choices. Economists study ordinary life using well-established methods, but many students find those methods to be profoundly weird. For example, economists take it for granted that people have at least some stable preferences, from which we can interpret their level of well-being. Are students willing to go there, based on their prior beliefs before the first day of class? This year I am testing the use of instant polling, and thought I’d try a warmup exercise before the first class to get at the wide variety of perspectives that students bring — starting with the most basic question of whether our choices are even predictable enough to explain. To reveal students’ baseline beliefs about decision-making, I created a survey asking them what fraction of last year’s choices we “regret and would do differently” if we “had the same options and circumstances as last year”. If peoples’ choices are predictable, they might also be ‘rational’. To the extent that we are predictably irrational, we can learn from our mistakes and not make them again. And we might also be entirely predictable but lacking free will. Economics traditionally focuses on ‘rational’ choices that we don’t regret and wouldn’t change, adding insights from psychology in the vast field of behavioral economics, and collaborating with people from other fields to explain all kinds of behavior like we do in the economics of nutrition. Much of life — including dietary intake — may be entirely random, or entirely deterministic. Economists are interested in those actions which are actually choices, because those actions might reveal stable preferences. Only when preferences are stable can we explain and predict choices, and allow outcomes to be ranked in terms of how far people get towards the outcomes they consistently prefer. The kinds of choices I wanted to include in my survey, in addition to food choice, concern other decisions we make frequently with varying degrees of regret and changing our minds. My highest priority was to include a question about gifts to others, to be sure that students don’t confuse being ‘rational’ with being selfish. (Econ 101 models often avoid the topic of generosity, but that’s just because the math is tricky.) I also wanted to include once-only experiences, like movies and live shows that we don’t know much about until it’s too late to change, and also alcohol since it’s entire purpose is to blur things. The final list, in alphabetical order, was choices about alcohol, clothing, food at home, food in restaurants, gifts, and travel. The survey was designed in part to reveal whether students thought differently about their own choices than about the choices made by other people. Perhaps there would be a kind of self-confidence bias, by which students believe their own decisions to be more predictable than other peoples’ choices. A belief in “rationality for me but not for thee” would myopic but understandable: since we know more about our own circumstances than those of other peoples, it’s hard to see why others behave as they do. Anyhow I was too rushed to register my analysis plan with AsPredicted and in any case I want to be clear that this poll was not human subjects research — it was done purely for teaching purposes in this class, and its sample size is too small to be generalized. To keep the survey short and avoid any kind of priming, confirmation bias or social desirability bias, I randomly assigned students to one of two nearly identical surveys. One asked “for each category below, thinking about your own actions, please guess what fraction of recent choices you regret and would do differently. “, and the other asked the same question but “thinking about other people like you“. I made it a series of 7 multiple-choice questions, asking if they expected themselves or others to “make all the same choices again“, “change less than one percent (<1%)”, “change less than five percent (<5%)”, “change less than half (<50%)”, or “change most (>50%)” of their own choices. I had to gather responses to make charts before class, by which time there had been about 85% response rate with 21-22 responses in each arm. You can see the whole questionnaire and all responses here. To summarize results, I’ll focus on the extremes: those who said choices are almost entirely predictable, meaning that they’d change less than 1% or make all the same choices again, versus those that would mostly change (>50%). 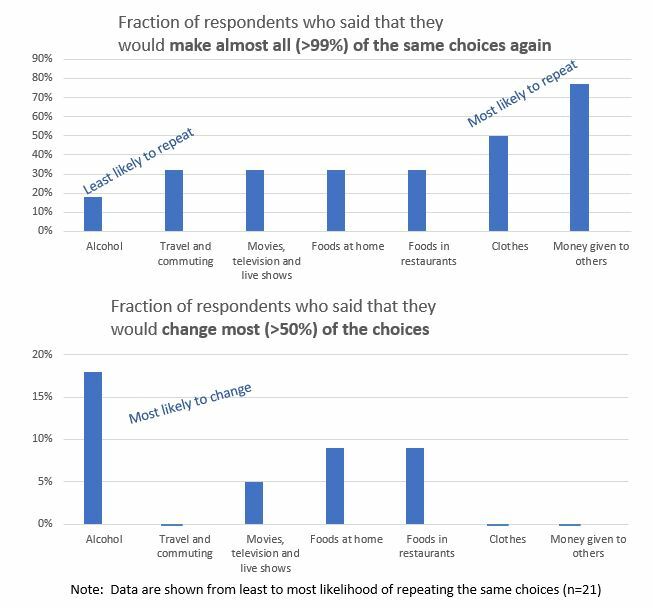 Among the students who were asked about their own choices, about a third felt that their food choices are almost entirely predictable, and about a tenth said they would change most of their food choices. Percentages were the same for food at home and in restaurants, which was contrary to my expectations: personally, I almost never regret what I eat at home, but do so fairly often when eating at restaurants. Maybe students eat in restaurants a lot more routinely than I do, so they know what they’re getting. 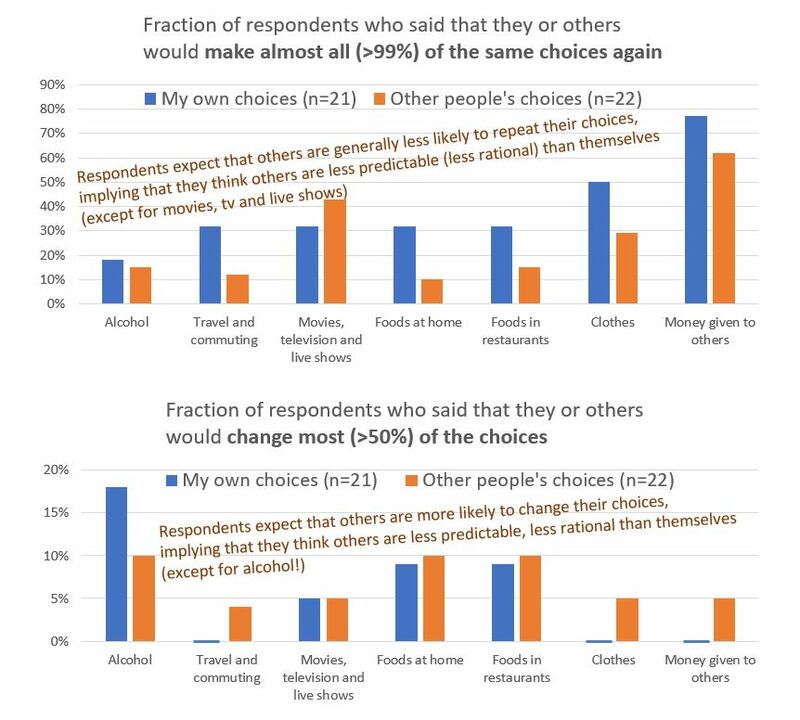 Respondents expected others’ choices to be less consistently predictable than their own, although responses for movies and shows were similar, and the big exception was alcohol: more respondents thought that they would learn and change their own drinking choices than that others would learn and change. That’s a particularly good example of self-confidence, although maybe just a January effect. (a) Many students think their own choices are likely to change and therefore hard to predict, and an even larger number believe that other peoples’ choices will change, even if their options and circumstances stay the same. Both are probably correct, although I’ll do my best to teach techniques that explain and predict a larger fraction of peoples’ choices. (b) Food choices are in the same ballpark as other things. Food is not unique in being subject to random (or seemingly random) whims and fads that change without explanation. (d) There is a lot of heterogeneity here, with very different answers from different respondents. In food choice, for example, a third would repeat almost all their choices while a tenth would change most of them. That’s why business schools teach marketing, so companies can spot their loyal customers and also identify people who might switch. I hope my economics class works kind of like that, serving all kinds of students in different ways. The USDA counts about 2 million farms in the U.S., almost all of which are still owner-operated family enterprises. Farming is the backbone of any food system. It requires a huge amount of management skill, but not a lot of time: the last big survey of labor use on U.S. farms found that they took an average of 3,250 hours per year to run, with family members still doing most of the work as shown for example in Table 4 of this report. The few jobs in farming that do exist are often seasonal, and they are highly spatially concentrated with limited growth potential. The chart below summarizes the overall employment data from successive waves of farm labor surveys in the 1990s and 2000s. The only category with continuous measurement are “directly hired” workers, which declined in the 2000s and has not increased since the 2008 recession. New employment opportunities in the food sector arise primarily off the farm. 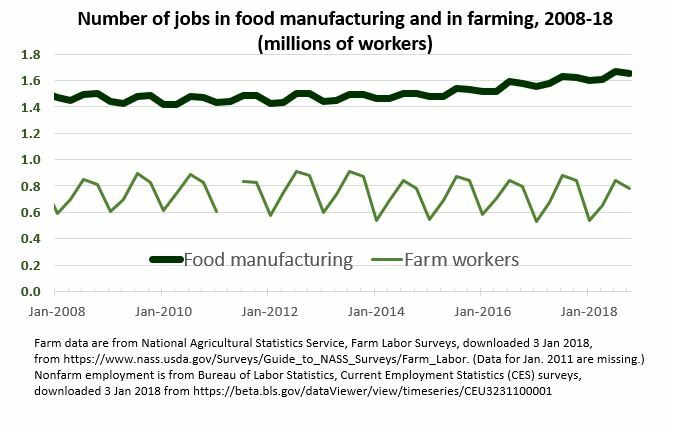 Food manufacturing alone provides about twice as many jobs as farming, and grew significantly from its post-recession bottom of 1.4 million jobs in January 2010 to an all-time high of almost 1.7 million jobs in July 2018. Data on non-farm jobs are collected by the Bureau of Labor Statistics, Current Employment Surveys. The chart below compares total employment on farms with the number of jobs classified as food manufacturing, from January 2008 through October 2018 to show post-recession growth in food manufacturing. By far the fastest growth in new jobs is in food and beverage service provision, for food away from home. 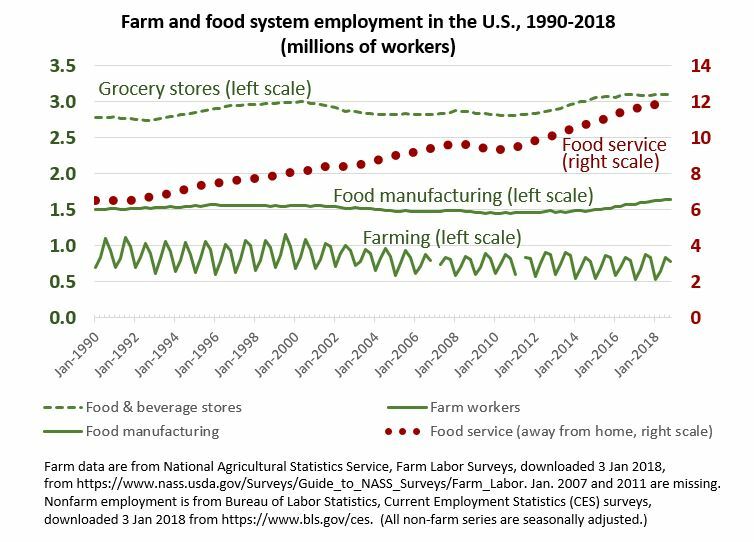 Using longer-term Current Employment Survey data allows us to compare the three main kinds of off-farm jobs in the food system: food manufacturing, food and beverage stores, and food services and drinking places. 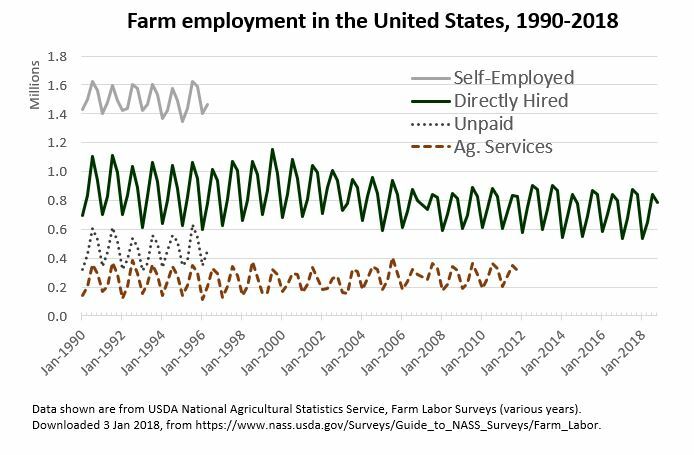 The chart below compares these three employment categories to on-farm employment, over the entire time period for which this kind of jobs data is available. Farm jobs are great. I’ve had one, but it was seasonal (summer of 1984) and when I worked through the winter it was part-time. Many more employment opportunities start after harvest, like my own high-school job making ice cream. Since 1990, food manufacturing has consistently offered about twice as many jobs as farming, grocery retailing in food & beverage stores now provides about 4x the number of jobs in farming. Employment in food retail rose from about 2.7 million to around 3.0 million jobs before the recession, and is now up to an all-time high of 3.1 million jobs. But almost 3 million jobs have been added over the past decade in food services, including restaurants and workplace dining or other food consumed away from home, which rose from a recessionary low of 9.3 million jobs in January 2010 to an all-time high of over 12 million in October 2018. Farms, food manufacturing, grocery stores and restaurant services are all interconnected. Each plays a different role in the food system. No farms, no food — but most of the labor is engaged after harvest, in processing and retail, especially in your local restaurants and other away-from-home food services. For Tufts and other schools in Massachusetts, today’s start of the academic year coincides with a primary election for state and federal offices. The campaigns have made some effort at persuasion but most focus is on mobilization: recent elections have been decided mainly by turnout, by which people invest the time and effort needed to vote. This morning I’ll walk to my polling place before going in to the office but most Americans don’t have that luxury. Differences in turnout arise precisely because people face very different barriers to voting, which itself is one of the most important questions in American politics. Starting the school year with an election seems fitting. I teach at the Friedman School of Nutrition Science and Policy, where much of the agenda concerns what governments do. And in education, like politics, enthusiasm matters. It takes effort to get involved — so thank you for showing up, at Tufts or other schools. And if you’re lucky enough to have elections this academic year, thank you for voting. Research in nutrition and the health sciences is often kept semi-secret until publication. Why? Does it matter? 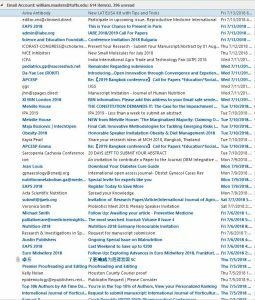 Scientists in many fields circulate their work in progress as widely as possible, hoping for feedback and citation even before submission to a journal. Institutions run their own working paper series (like the Tufts economics department), individuals use their own websites (like my personal site), and many use general repositories (like arXiv and SSRN). Acceptance at a top journal certifies the quality of the final version and facilitates dissemination, but draft work in the physical and social sciences is typically circulated as widely as possible before publication. In nutrition and health research, the default rule is secrecy. Results are typically kept confidential until publication, even for work that will be eventually be published on an open-access basis. Study designs for human subjects research is disclosed through registries like clinicaltrials.gov, and ongoing work may be described at conferences from which brief abstracts are published in outlets like the FASEB supplements, but detailed methods and results are not generally shared until publication day. The difference between fields is nicely illustrated by a twitter thread reproduced in this post, in which I experimented with sharing a photo album from an agricultural economics conference so as to see connections between different presentations. 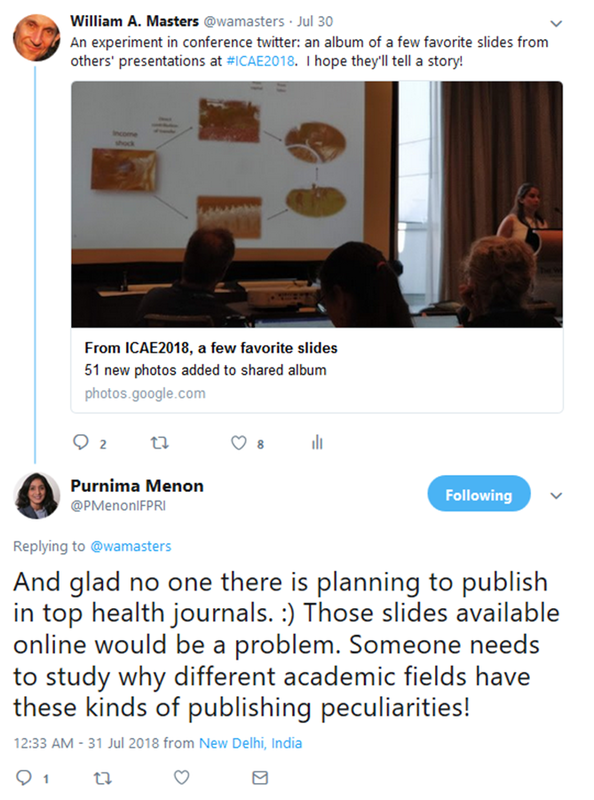 That led to quick reply from a leading nutrition researcher, Purnima Menon, who noted that posting photos of slides could jeopardize publication in top health journals. A specific example of how nutrition research is kept hidden until publication comes from a recent conference that I organized at Tufts, called GlobalFood+. This event was designed around 7-minute speed talks designed for sharing on the internet — but one of the best talks had to be kept off our website. Confidentiality of work in progress can be important to prevent theft of ideas, to ensure that scientists receive credit for what they do. Limiting prior publication might also be important for subscription-based journals, to ensure that institutional libraries want that journal in their collection. But neither rationale applies when working papers can be cited, and when publication fees are paid for open-access articles. In general, the primary reason to discourage prior sharing is to pursue media coverage. Journal publishers make this clear, as in the statements against ‘pre-publicity’ at the top general outlets, Nature and Science. Previous posting is especially discouraged in the top medical journals, as explained by JAMA and NEJM. They encourage publication of teaser abstracts, like a movie trailer, but detailed results are subject to a media embargo until publication day. Universities and research labs are keen to cooperate, in the hope that science journalists will treat the paper’s arrival as a newsworthy event. 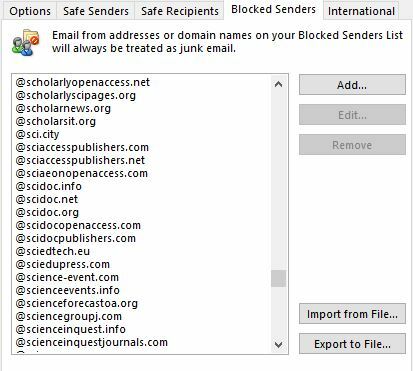 Embargoes may be needed in some case, but for most studies the scientific community is turning against pre-publication secrecy. Treating publication as a news event is itself a problem, contributing to ‘study-a-day’ media coverage that exaggerates the importance of new studies relative to previous knowledge. And limiting prior scrutiny to a handful of referees and editors raises the risk of error. Policies favoring prior circulation of working papers were adopted long ago in PNAS, and have recently been adopted in the health sciences at BMJ and The Lancet. In nutrition, the AJCN and Journal of Nutrition still put some limits on prior circulation, discouraging their use. Why would different kinds of journals have different policies? One factor could be audience demand for different kinds of news. Many people want to know about the latest findings in nutrition and medicine, so media outlets often assign reporters to meet that need. Universities are happy to supply a curated flow of individual studies in the specific fields that reporters most want to write about, like dietary advice and lifestyle choices. Managing the flow of news is also important for high-stakes pharmaceutical trials and other controversial studies. But in many cases, secrecy before publication is sought mainly to protect the economic interests of the publisher. With JAMA, NEJM and some others, subscriptions are still important so they must restrict prior publication to enforce a paywall. And some journals like Science and Nature run scientific articles alongside weekly news about science, with significant revenue from ads for lab equipment and materials. 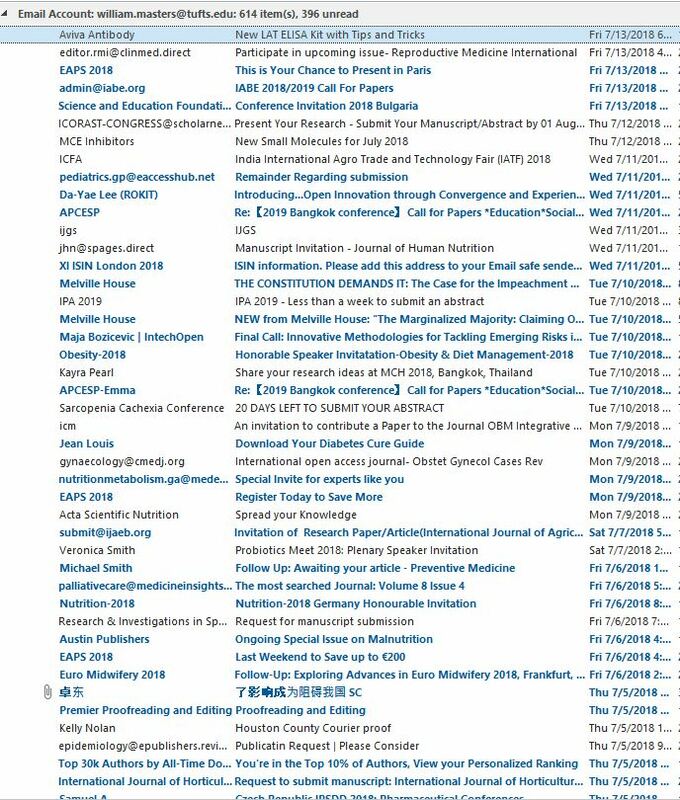 These journals need publicity to attract traffic for their journal as a news source, to sell both subscriptions and advertising. Scientific work is changing fast and it’s hard to keep up. 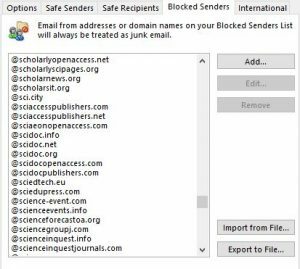 For example, my previous foodecon post was about how to limit the plague of academic spam. Much is being written about the business of scientific publication, including great nonprofit work by Scholarly Kitchen and the EmbargoWatch blog by Ivan Oransky (who also blogs at RetractionWatch), as well as superb reporting on academic life by insidehighered.com and chronicle.com. Personally, I hope that the tradition of pre-publication secrecy is soon replaced by wider circulation of working papers, even in nutrition and the health sciences. Sharing work in progress would raise overall quality, and help break reporters’ study-a-day habit and encourage them to cover the overall flow of knowledge. Wouldn’t that be nice? For context, you might check out posts from previous years, or additional photos from this one here. As always, respect and thanks to our august jury of distinguished food economists, not just Norbert but also Sean Cash and Parke Wilde. Time for an econo’food recipe book project, anyone? With that… time for what might might be my first mistake: an overly long blog post. In the past I’ve used this site to post short roundups of great new stuff from the internet, with links to some of the best ideas that feel new to me for the start of each semester. Topics have included filter bubbles, redefining sustainability, song lyrics, ethical economics, teaching economics, and data visualization. My goal is share ways to avoid previous errors, so when I do make mistakes at least they’ll be new ones. In 2017, the whiplash transition from Obama to Trump has shaken every aspect of American life, down to the root of rethinking how we talk about race, gender and other aspects of who we are. That calls for many things, including perhaps the need to address those issues more directly in this kind of blog. Taking on something so fundamental as social identity means my mistakes could be bigger and more consequential than usual, but I hope they are not quite the same old errors as in the past. For NUTR 238, our focus is how economics can help improve the food system. Economic analysis starts with individuals’ choices, and there is now a lot of economics about how we form and use various identities. What sort of person do we want to become? How do we categorize other people? Identities like being a vegan or an environmentalist play huge roles in our food choices, and could even cause bias in nutrition research. Many features of social identity are inherited, and change only gradually. My own family name was changed completely by my great-grandfather on arrival in Boston. My father’s parents changed it again, to sound even more English. Identity evolves in part through choices like that – and yes, there are economics studies of this, both family names and first names. Each of us has many interacting identities, of which some aspects are private and others can be used as a public signal. Many signals involve things we say, including what we say about race and gender. A meta demonstration of this is one of my favorite signs from the women’s march of January 2017: If it’s not intersectional, it’s not feminism. That sign says a lot, including: I am a person who uses the word ‘intersectional’. By definition, the meaning of a social identity is what other people make of it – especially distant people, who don’t know the real you. As the old joke has it, a loving parent might say their kid in a new uniform, “To me of course you’re a real captain, but… to a captain are you a captain”? We can alter our own social identity through our names, our language and clothing – and we can also contribute to how others’ traits are interpreted, including immutable traits like skin color. Regarding racial identity, as a white professor in a largely white school, my own change of perspective begins with Seeing White. It’s a long-form podcast, 14 episodes each of which runs for 30-45 minutes. New listeners might start with the last episode on transformation that includes a lot of solid economics. Agriculture and nutrition are mentioned only in passing, but the question of food justice does appear; in that last episode Robin DiAngelo describes her own initial self-perception as “of course I’m not racist — I’m a vegetarian!” As an aside, this series with a nice personal connection to our field because the co-host’s mother is a prominent nutrition professor. Regarding gender dynamics, my job is a lot easier. The Friedman School’s student population is about 85% female, and the faculty about 65% female. There are plenty of problems in the field of nutrition, but teaching at Friedman is an escape from so much more sexism in economics. In NUTR 238 we already devote a lot of class time to gender as a topic, and on all topics I feature the work of many great female economists so students will know it’s not all men. I also try to manage classroom dynamics in a way that will help students express their own point of view. I rarely call on anyone until they raise their hand, to encourage self-motivation, and gender disparity in classroom participation runs so deep that by week 3 or 4 there’s inevitably a moment when raised hands are almost all male. That’s what we call a teachable moment: I can stop the class to ask why – and point out that everyone else needs to speak up for their own perspective to heard. Most importantly for our work at the Friedman School, thinking about diversity and inclusion includes discovering the unintended consequences of our own identities within the food system. The big change in the NUTR 238 curriculum for 2018 will be on that front. I will try to do even more than in the past regarding racial, gender and other disparities in the food system, but what I’ll add for the first time is the possibility of unintended harms from identities over which we have more choice: for example, that ‘healthism’ might worsen weight discrimination, or how the food movement affects the urban-rural divide. When talking about identity and its consequences, we’ll surely make mistakes – but if we learn from each other we can make some real progress. On to a new semester! A big part of economics is data analysis, which starts with data visualization: “seeing like an economist” means looking for patterns across many observations, recognizing that the data we see result from peoples’ choices. In class we practice this through weekly exercises and a course project that start with analytical diagrams (such as supply and demand curves) to show the logic by which we explain each observation, and then download data from authoritative sources to make our own charts and tables that summarize what’s been observed. This blog post pulls together a few suggestions and links about data visualization for convenient reference. The dataverse of available information is expanding rapidly, with increasingly sophisticated expectations about data visualization. That complexity can be daunting, making it hard to get started. My vote for best quick advice about data is to keep it simple, as explained in great posts about how to clear off the table and remove to improve. Those start with bad examples and show how to clean things up and avoid numbo-jumbo. Successful data visualizations help you tell a story, by making comparisons that highlight both similarities and differences. Charts and tables offer a kind of language designed to help us communicate clearly. The grammar of this language is nicely explained here: http://abacus.bates.edu/~ganderso/biology/resources/writing/HTWtablefigs.html. Change over time is usually best shown with line graphs like Figure 1 of that page, while differences among categories is usually best shown with bar charts that are sorted by magnitude, and a cloud of individual observations is best shown by a scatter plot. It’s useful and fun just to browse through the different charts presented here: http://www.ers.usda.gov/data-products/chart-gallery.aspx, and also click through https://www.ers.usda.gov/data-products/data-visualizations. Other thoughtful guides to making scientific charts and tables include: http://guides.library.duke.edu/datavis/topten and https://www.statisticsauthority.gov.uk/gsspolicy/effective-graphs-and-tables-in-official-statistics. For oral presentation, your charts and tables should appear in ways that help you tell the story. There are many good guides to using PowerPoint effectively, of which one of my favorites is from a prominent biologist named Susan McConnell: https://www.ibiology.org/professional-development/designing-effective-scientific-presentations. And finally, if you’re interested in guides to writing in general, my favorite is Steven Pinker’s Sense of Style — especially for his brilliant description of how all communication requires effort to overcome the curse of knowledge, in part by chunking information into digestible units which you can then bundle up into increasingly powerful stories. I look forward to seeing how you put your pieces together!